I was lucky enough to see a 2017 HD restoration of this black and white movie recently on MUBI, the movie streaming service for those of us who like to look beyond mainstream cinema. Written and directed by the late, great Curtis Harrington (Queen of Blood, What’s the Matter with Helen? and Killer Bees among others), I consider this more a quirky melodrama than a horror film, with a story of love and yearning at its heart. 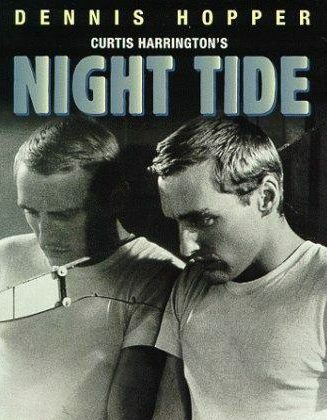 On shore leave, a young and lonely sailor (Dennis Hopper) becomes enamored of a beautiful young woman (Linda Lawson) he meets at a jazz club in Venice Beach. She plays a mermaid in the local carnival, but she is shrouded in sadness and mystery. I can certainly see the cult appeal to film lovers like me – this is the kind of thing that played late on Friday night TV when I was kid and there’s a big nostalgia element for me. The score is by the celebrated David Raskin and the beautiful black and white cinematography by Vilis Lapenieks. And even here, in one of his first starring roles, Dennis Hopper is a standout. This is a stunning restoration of a really sweet, moody and melancholic B-movie. If you get a chance to see it, do it!